When buying or selling an option, you must choose from a set of predetermined price levels at which you will enter the futures market if the option is exercised. These are called strike prices. For example, if you choose a soybean option with a strike price of $7 per bushel, upon exercising the option you will buy or sell futures for $7. This will occur regardless of the current level of futures price. Strike prices are listed at predetermined price levels for each commodity: every 25 cents for soybeans, and 10 cents for corn. When trading is initiated on an option, trading is available at a series of strike prices above and below the current future’s price. For example, if the July corn futures price is $3, there will be corn options introduced with strike prices of $2.80, $2.90, $3.00, $3.10, and $3.20. If futures price increases (decreases), additional strike prices are added. When buying an option you must choose which delivery month you want. Options have the same delivery months as the underlying futures contracts. For example, corn options have December, March, May, July, and September delivery months, the same as corn futures. If you exercise a December corn op­tion you will buy or sell December futures. Exercising an option converts the option into a futures position at the strike price. Only the option buyer can exercise an option. 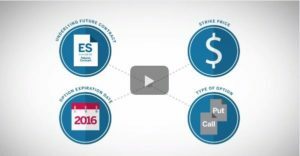 When a call option is exercised, the option buyer buys futures at the strike price. The option writer (seller) takes the opposite side (sell) of the futures position at the strike price. 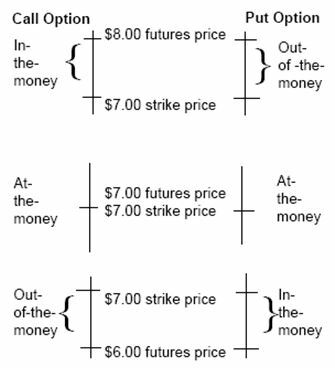 When a put option is exercised, the option buyer sells futures at the strike price. The option writer (seller) takes the opposite side (buy) of the futures position. Because of the option seller’s obligation to take a fu­tures position if the option is exercised, he/she must post margin money and is faced with the possibility of margin calls. If you have already purchased an option, you can offset this position by selling another option with the same strike price and delivery month. You are now out of the options market. 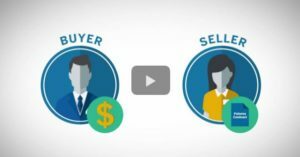 The amount of gain or loss from the transaction depends on the premium you paid when you purchased the option and the premi­um you received when you sold the option, less the transaction cost. However, if the option you sell does not have the same strike price and/or delivery month as the option you originally purchased, you will now have two positions in the market; one as a buyer and another as a seller. If you have written (sell) an option, you can offset this position by buying an option with the same strike price and delivery month. You are now out of the options market. The amount of gain or loss from the transaction depends on the premium you received when you sold the option and the premium you paid when you repurchased the option, less the transaction cost. However, you run the risk of having the option exercised by the buyer before you offset it. An option expires if it is not exercised within the time period allowed. The expiration date is the last day on which the option can be exercised. Options expire in the month prior to contract delivery. For example, a July corn option expires in June. If the futures price drops below the strike price, the option buyer will not exercise the option because exercising will create a loss for the buyer. In this situation the option buyer will let the option expire worthless on the expiration day. The only money transfer will be the premium the option buyer originally paid to the writer. The seller of a call option loses money if the futures price falls below the strike price. If the decline is more than the income from the premium less the cost of the transaction, the seller has a net loss. If the futures price rises above the strike price, the option buyer will not exercise the option because exercising will create a loss for the buyer. In this situation, the option buyer will let the option expire worthless on the expiration day. The only money transfer will be the premium the option buyer originally paid to the seller. As discussed previously, the amount paid for an option is the premium. The option buyer pays the premium to the option writer (seller) at the time of the option transaction. The premium is the only part of the option contract that is negotiated. All other contract terms are predetermined. The premium is the maximum amount the option buyer can lose and the maximum amount the option seller can make. An option premium is composed of intrinsic and/or extrinsic value. The intrinsic value is the amount of gain that can be realized if the option is exercised and the resulting futures position closed out. A call option has in­trinsic (exercise) value if the futures price is above the strike price. A put option has intrinsic (exercise) value if the future price is below the strike price. 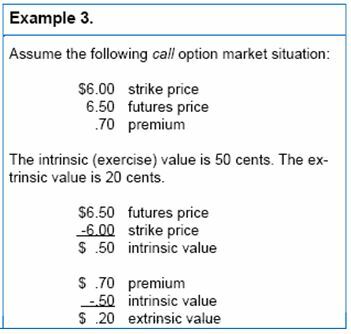 Extrinsic (extra) value is the amount by which the option premium exceeds the intrinsic (exercise) value. Extrinsic value is the return that option writers (sellers) demand in return for bearing the risk of loss from an adverse price movement. All option premiums contain extrinsic value except at expiration. Because of extrinsic value, an option buyer can sell an option for as much or more than its exercise value. Time value – Time value is based on the length of time before the option expires. If the expi­ration date is far-off, time value will be high. As expiration approaches, the time value de­clines. At expiration, no time value remains. Future price vs. strike price – The relationship of the futures price to the strike price affects the extrinsic value. The extrinsic value is highest when the futures price is the same as the strike price. The extrinsic value declines as the fu­tures price moves away (above or below) from the strike price. Market volatility – As the futures market becomes more volatile, the extrinsic value increases. Additional commonly used option terms are discussed below. These option terms pertain to the relationship between the current futures price and the strike price. An option is in-the-money if it has exercise value. In other words, a call option is in-the-money if the current futures price is above the strike price be­cause it can be exercised at the strike price and sold at the current futures price for a gain. A put option is in-the-money if the current futures price is below the strike price. An out-of-the-money option has no exercise value. A call option is out-of-the-money if the current futures price is below the strike price. Conversely, a put option is out-of-the-money if the current futures price is above the strike price. An option is at-the-money if the current futures price is the same as the strike price. A one cent change in the future price will put the option either in-the-money or out-of-the-money. Below are examples of call and put options that are in-the-money, at-the-money, and out-of-the-money. Below are actual examples of soybean option premiums for various strike prices and delivery months. The premium for each strike price and delivery month is listed. In parentheses are the intrinsic (exercise) value and the extrinsic value for each op­tion premium. The current futures prices are at the bottom of the table. 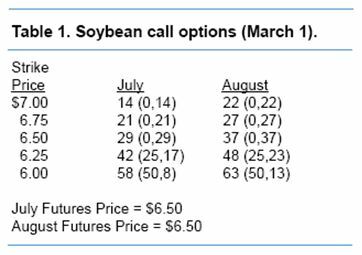 Soybean call option premiums on March 1 are shown in Table 1. The current futures price for the July and August futures contracts is $6.50. At this price the $6 strike price option is in-the-money by 50 cents. 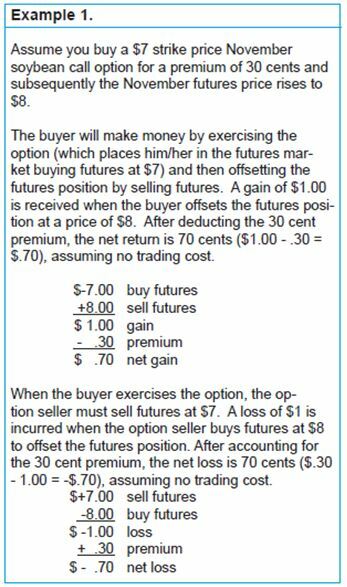 If this option is exercised, the option buyer will own a futures contract purchased at a strike price of $6. The option buyer can then sell the contract at the current $6.50 futures price for a gain of 50 cents ($6.50 – 6.00 = $.50). The $6.00 strike price option has extrinsic value of 8 cents, the difference between the premium and the exercise value. The $7 strike price July option has a premium of 14 cents. It has no intrinsic value because it is out-of-the-money by 50 cents. Futures price would have to rise by over 50 cents before the option would contain any exercise value. Its extrinsic value is 14 cents. The $6.50 strike price July option is at-the-money. It has no intrinsic value but has extrinsic value of 29 cents. The options with strike prices at-the-money and out of-the-money have premiums containing no intrinsic value (exercise value.) Only those options that are in-the-money have premiums with intrinsic value. The August options have higher extrinsic values than the July options. For example, the July $6.50 strike price option has extrinsic value of 29 cents while the August $6.50 option’s extrinsic value is 37 cents. This occurs because the August option will be traded for a longer period of time than the July option. The time period from March 1 to mid July, when the August option expires, is four and one-half months. The time period from March 1 to mid June for the July option is only three and one-half months. Call option writers (sellers) bear the risk of loss due to a price rise. They demand a higher return (premium) for bearing this risk for a longer time period, especially considering that June and July are usually periods of price volatility due to the crop growing season. The extrinsic value is 29 cents for the at-the-money July $6.50 strike price option. It is only 14 cents for the 50 cents out of-the-money option ($7 strike price option) and 8 cents for the 50 cents in-the-money option ($6 strike price option). So the extrinsic value decreases as the option moves further out-of-the-money or in-the-money. 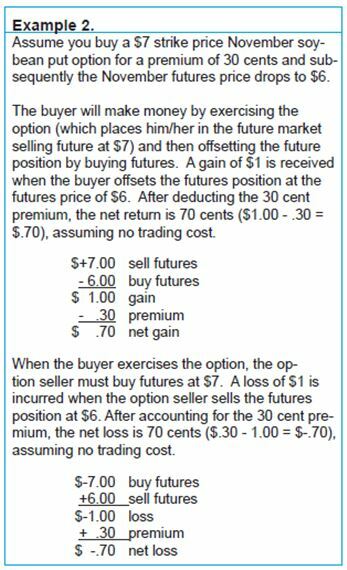 An option trader who is writing a call option for $6.50 will be liable for exercise value if the futures price increases by only one cent. However, by writing a $7 option, the futures price will have to rise by over 50 cents before the writer will be liable for exercise value. So the writer will demand a higher return (extrinsic value) for writing an at-the-money option. 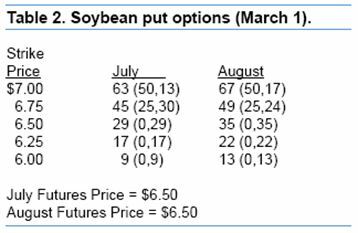 Soybean put option premiums are shown in Table 2. The strike prices and delivery months are the same as Table 1. The date on which the option quotes were taken (March 1) and the futures prices ($6.50) are also the same. The premium relationships are similar to those of the call options of Table 1. However, the put option premiums with strike prices above the futures price contain intrinsic value while those below contain no intrinsic value. This relationship is opposite to that of the call options in Table 1. This occurs because exercising a put option places the option buyer in the futures markets selling (rather than buying) futures at the strike price. The futures position can then be offset by buying a futures contract at the lower price for a gain. 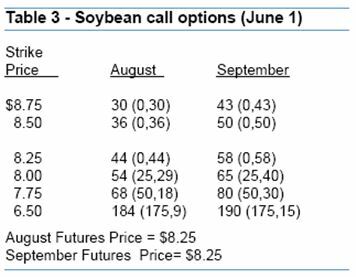 Soybean call option premiums on June 1 are shown in Table 3. Futures prices have risen from $6.50 to $8.25 during the three month period. The March 1 $6.50 strike price at-the-money August call option is now worth $1.84. The premium contains intrinsic (exercise) value of $1.75 ($8.25 – 6.50 = $1.75) plus 9 cents of extrinsic value ($1.84 – 1.75 = $.09). If you had purchased a $6.50 strike price August call option for 35 cents on March 1, you could now sell it for $1.84 for a gain of $1.49 ($1.84 -.35 = $1.49) not including trading costs. The at-the-money option is now the one with the $8.25 strike price, rather than the $6.50 strike price. The extrinsic value is greater on June 1 than it was on March 1. For example, the extrinsic value for the August at-the-money ($8.25 strike price) option is 44 cents rather than 35 cents that the at-the-money ($6.50 strike price) option was on March 1, even though the time value is three months less (1 and a half months to expiration vs. 4 and a half months). This is because the market is much more volatile on June 1 than it was on March 1. Because of market volatility, option writers demand a higher return to compensate them for the greater risk of loss due to a rapidly changing market.